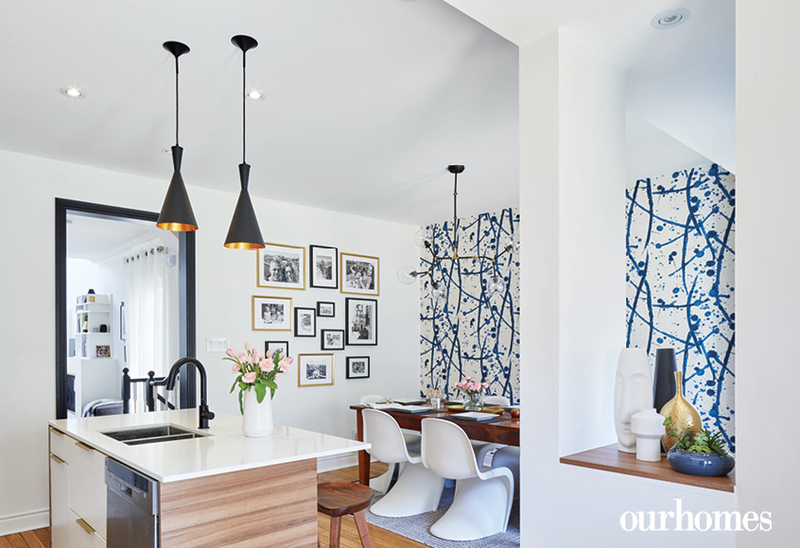 Modern updates honour the character of this Toronto home in The Beaches. 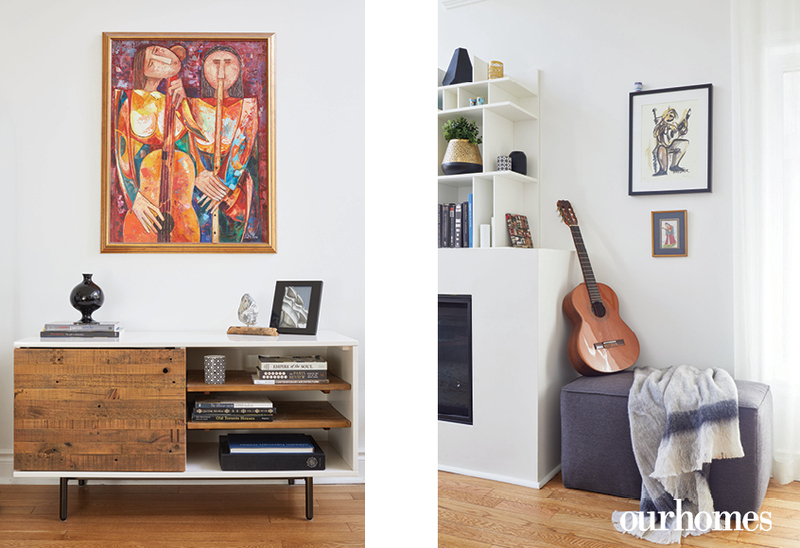 With two kids nearing the end of high school, this Toronto family of four decided it was time to invest in a new look. 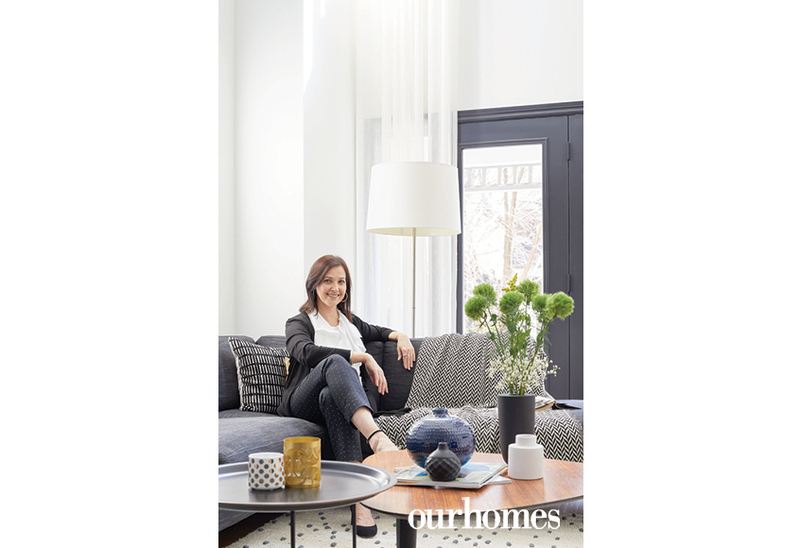 The family had enjoyed their home for almost a decade in The Beaches when they reached out to designer Elena Gouchtchina of Maison Interiors. While the home is newer, built in 2001, it is typical of the area. “Like most houses in The Beaches, it’s not gigantic, but it is open concept, with a spacious kitchen and dining area. The main floor also has a cathedral ceiling; we really liked that,” says the owner. Initially, the couple consulted with Elena on new furniture for the living room. “One of the requirements the homeowners had was for the space to be minimalistic but comfortable, so the whole family could use it. They wanted to create a cosy room where they could watch TV and entertain. 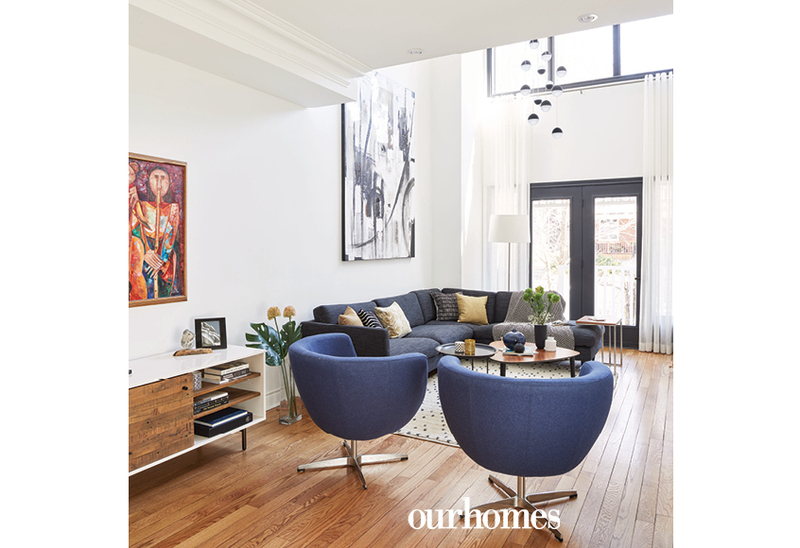 "We came up with a floorplan that included a custom sectional from BoConcept, two custom tub chairs from EQ3, and for additional seating, two square ottomans that could be tucked away or brought out when needed,” says Elena. A chandelier from Living Lighting accentuates the height of the cathedral ceiling. But to make it all fit, they first had to move a bulky fireplace. "We designed a custom unit with a minimalistic, modern look that created more space and a better flow to the room.” The owners love it. “The swivel chairs can face the sectional and fireplace or face the other way. They’re functional as well as super cool. It flows beautifully. Now my wife and kids are always in this room,” he says. Next up was the kitchen and dining room. It had to be a continuation of the living room because of the open space, and they settled on a white kitchen, with walnut accents for warmth and gold hardware and a mosaic backsplash for an elegant, sophisticated feel. In the dining area, Pierre Frey blue-and-white wallpaper from Primavera Interior Furnishings Ltd. makes a statement with its bold look. By maximizing the space, the narrow living room was transformed into a beautiful, functional room. The owners love it. “The swivel chairs can face the sectional and fireplace or face the other way. They’re functional as well as super cool. It flows beautifully." says the owner. Elena Gouchtchina of Maison Interiors saw the potential and brought this beautiful Beaches home to life. 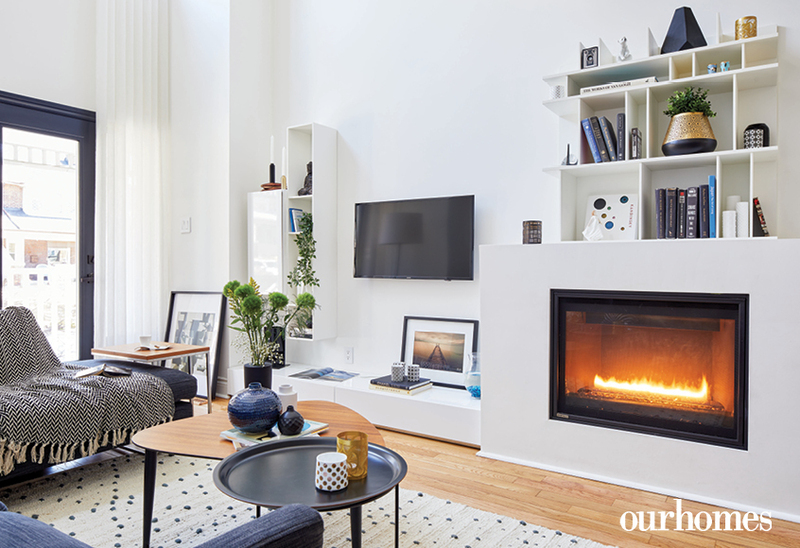 The new custom fireplace is topped with a bookcase from BoConcept. Layering accents adds depth to the room. 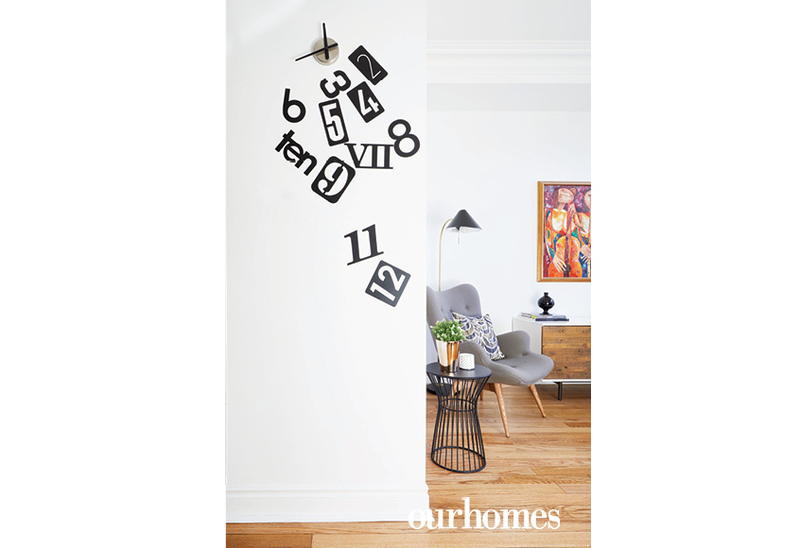 A wall clock with random numbers adds a little fun. Items are handy but tucked out of sight in a sleek console. An ottoman serves as extra seating and is easily tucked next to the fireplace when not in use. Open walnut shelving captures the warmth found throughout the main floor. They added a full-size pantry with pullout shelves, and new cabinets feature walnut details and gold hardware. 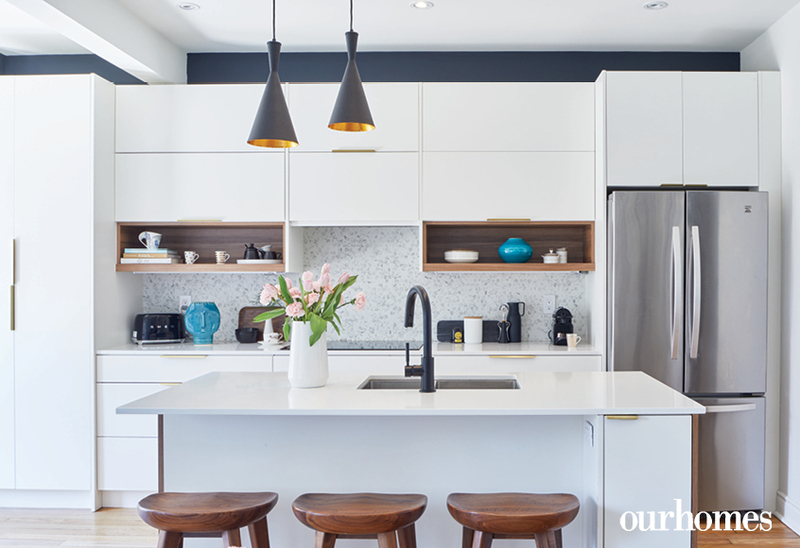 “It’s very sleek and subtle, but it still brings warmth to the kitchen,” says Elena. The kitchen and dining area are one open space, so the colours and textures that complement each other were used for continuity. Elena also replaced the kitchen island with one that has a larger footprint and could be used as a breakfast table that fits three, and has a bench with spacious storage installed along the window. Bold, beautiful blue wallpaper adds energy and makes a statement in the dining area. A built-in window bench lined with pillows from BoConcept also boasts additional storage. 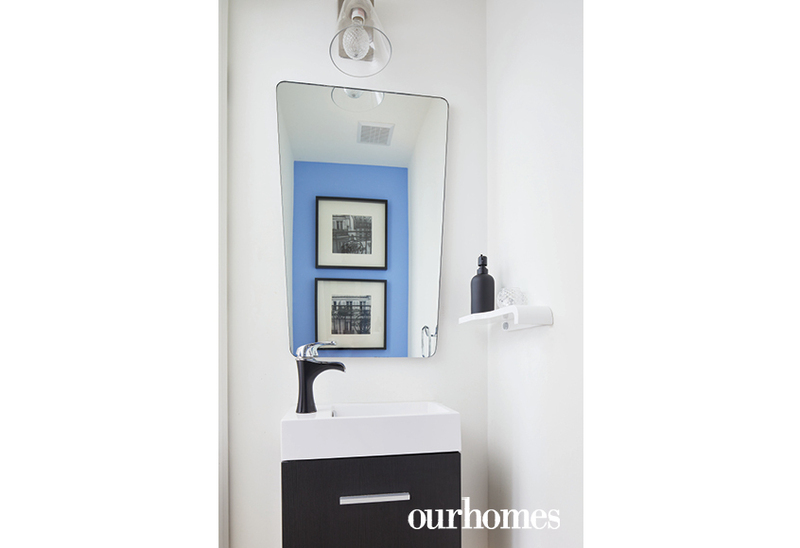 The black and white theme carries on through to the powder room, which boasts a Parisian feel with a black faucet and blue accent wall with black-and-white prints.